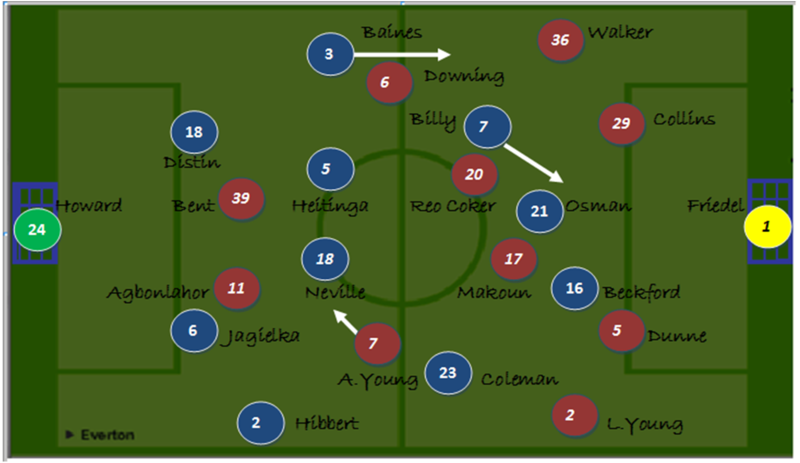 Everton made enforced changes, with Heitinga and Billy coming in for Rodwell and Cahill as the Blues lined up 4-4-1-1, with Osman playing off Beckford. It shows how threadbare our squad is that there was a combined total of 0 premier league starts from the lads on our bench. Villa sprang a surprise going with 2 strikers, with Agbonlahor and Bent up top with Downing switching to the right to accommodate Ashley Young on the left in a more orthodox 4-4-2. Diniyar Bilyaledtinov had an eventful game today. The Russian’s output has been questioned in some quarters and today’s game showed the good and bad side of his game. Going forward he created 3 really good goal scoring chances (all for Osman). The first of which led to the games opening goal as Billy robbed the ball from Kyle Walker before rolling the ball to Osman. The quick footed midfielder is on a hot streak of form at the moment, and his nice dummy bamboozled the flat footed Collins before sliding the ball past Fridel. 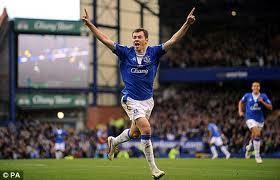 The goal was a classic Osman strike, and showed the benefit of a player being good with both feet. Whilst the game was an exciting one, the quality was quite poor in terms of passing. Villa had more of the ball in terms of passes made (413 v 344) but Everton had a better pass completion (64% v 59%) This was still our lowest pass completion figure of the season and the lowest amount of successful passes we have completed in a home game this season. Villa’s pass completion of 59% was the second lowest of our opponents this season, with only the route one Stoke having recorded a lower figure. As good as our left side is going forward, it can leave us vulnerable at the back and this was exploited just after the break. Going back to Billy, the defensive side of his game needs to be developed by the coaching staff. He is weak in terms of physicality, particularly in the air where he lost 7 of his 10 aerial duels yesterday. 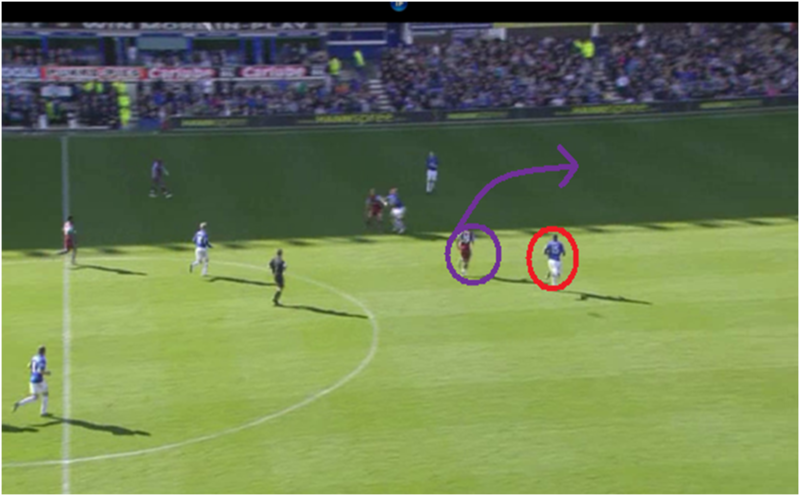 Villa’s equaliser came when the ball was worked out wide to Downing with Billy looking on (below). In fairness, Downing is a quality player and Villa’s threat on the break was evident all afternoon. Poor communication between Billy and Baines here, Billy (circled) should really be busting a gut to get out to Downing here to assist Baines as shown by the arrow, he doesn’t and Downing is allowed a one on one to slot to Bent for the equaliser. There will no doubt be calls for goaline technology following Jermaine Beckford’s ‘ghost goal’ shortly after, when put through by Magaye. Even more ghost like was Everton’s defence from the restart, clearly switching off as Bent is allowed the freedom of Goodison to slot the ball past Tim Howard into the vacated goal. Build up to Bent’s 2nd goal. 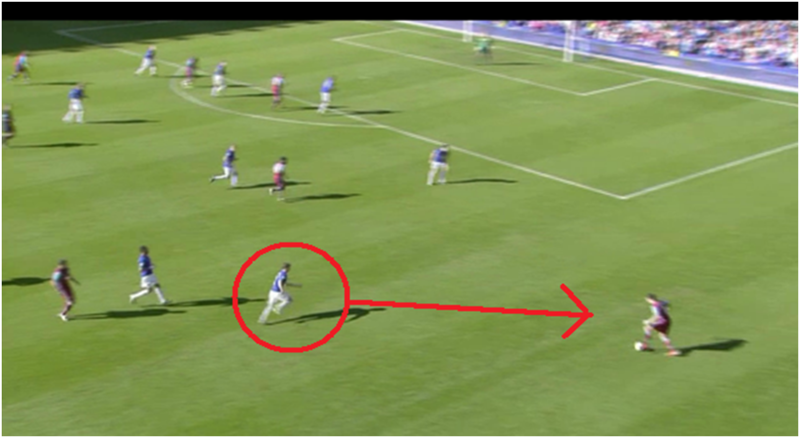 Initially circled with his marker Distin, Bent makes a clever spinning run off Distin in between him and Hibbet, and is not tracked by Distin until its too late. The introduction of Magaye was a good switch from Moyes and he looks like a really promising kid, injecting some much needed penetration. He provided something we had really been lacking on the flanks all-day, with Coleman clearly not fit and Billy not prepared to take players on. In the 38 minutes he was on the pitch he took on an opponent 9 times (beating his marker 4 times). Billy in comparison took on his marker just once. There was more controversy with the clock ticking down, as a very rare attacking surge from Phil Jagielka was cut short by Makoun. The penalty award seemed very dubious, but given what had happened earlier and in the context of the game it was deserved and Baines duly lashed it home. When looking at the players unavailable today this was certainly a good point for the Blues. Under Moyes we sometimes seem better when our options are reduced in terms of personnel and this was again the case today. Given the clear cut chances spurned though, we could have taken the 3 points here against a Villa side that are impressive going forward but have a defensive fragility. Time for Billy to take centre stage? With Pienaar now departed there has been much discussion on who can fill the creative void left by the South African with names such as Eagles and Kranjcar mooted as potential replacements. There is a player closer to home though who is more than capable of plugging the gap…. 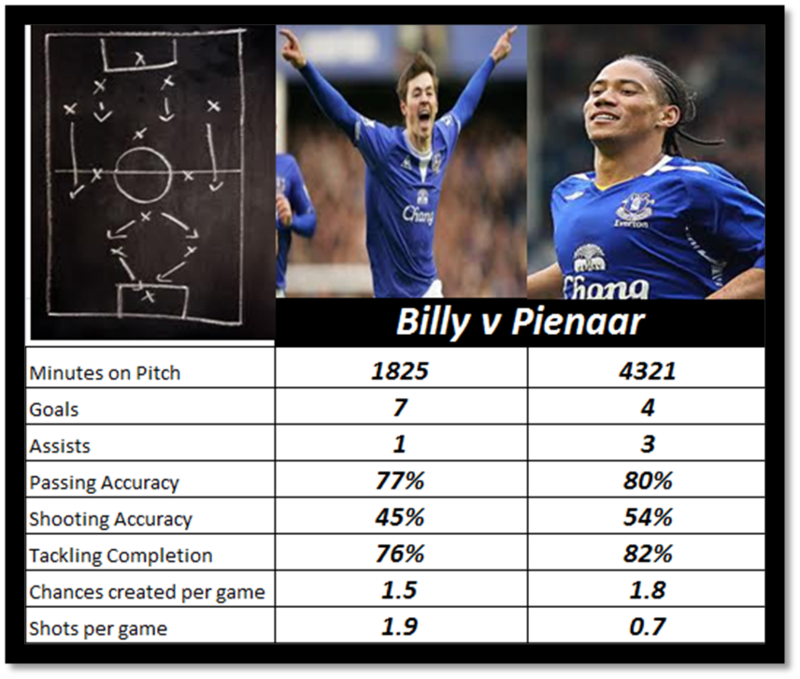 No one would doubt Pienaar’s ability or his commitment but often there was no end product to a lot of his good work, particularly in terms of goal scoring. With goals in very short supply from Everton midfielders this campaign, Billy needs to come into contention. Billy can get you a goal from nothing as was the case against Man Utd and Portsmouth last season. Whilst he isn’t blessed with pace he has clever feet and can beat a player and shift the ball from one foot to the other as shown for Russia in the WC Playoff against Slovenia last season. He is more direct and this is something we have lacked this campaign with our matches characterised by an abundance of possession but no end product with creating chances and goal scoring holding us back. Billy possesses great delivery from wide areas and a great shot. Billy v Piennaar – Stats from when Billy joined the club. It was clear from Moyes post match press conference on Saturday that he is tempted to push Fellaini forward for next weeks Cup tie with Chelsea after the impact he made in the final 20 minutes against West Ham. Moyes started with Osman on the left against the Hammers as whilst he doesn’t quite have the technical ability of Pienaar, he certainly has the intelligence and movement to tuck in and enable Baines the freedom of the left touchline. If Moyes does wish to go with Felli advanced against Chelsea I would deploy Arteta as anchor, move Osman inside (in my opinion his best position) put Billy on the left and Fellaini playing off Saha. My only fear is that we are going to over use Fellaini and revert to an overly direct style of play. My opinion is that we need Billy in the team, but in what position? Lets have a look at the options……. Naturally a left footed player so can and has done a job here in the past. Positives are that he can provide quality delivery and is capable of cutting in and shooting with his right foot which doesn’t pack as good a punch as his left but is still decent. Negatively, he prefers to play on his left foot so would prefer to stay on the flank rather than tuck in on his right which was the key ingredient in Pienaar’s relationship with Baines. This season the left side would appear his most likely chance of first team selection. The bulk of his goals have come from central positions, notably the strike against Portsmouth on the final day of the season but he also shows great composure inside the box – often deployed for the Russian national team in this role . Playing in a more advanced position would relieve him of greater defensive responsibility which comes further back in the field. Playing in this Riquelme style role, pace isn’t key so it would suit him well. He is also adept at threading balls through to a central striker, on average creating 1.5 goalscoring opportunities per game. With Cahill due back from international duty soon it is unlikely he will be given an opportunity here. Moyes has also stated in the press that he doesn’t see him being deployed here anytime soon. Cutting in on his preferred left foot, right midfield would be his most natural position in terms of the style we play with wingers cutting inside. As was shown with the goal against Man United last season he is lethal in this area and can get a goal out of absolutely nothing. The form of Seamus Coleman this season would probably inhibit his chances of getting the nod here but long term I would say this is the best bet to get the most out of Billy.